OAKLAND, California, July 8, 2013 (ENS) – The U.S. State Department is in the process of deciding whether the proposed Keystone XL tar sands oil pipeline would be in the U.S. national interest, but the determination is being made without Keystone XL’s digital GIS data, such as the longitude and latitude of milepost markers, waterbody crossings and the centerline route. In response to a Freedom of Information Act, FOIA, request for the proposed pipeline’s digital GIS data, the U.S. State Department stated that not only did the proposing company, Calgary-based TransCanada Corp., not submit the location data to the department, but that the State Department neither requested or required it. As this data is frequently cited throughout the proposed Keystone XL’s Final Environmental Impact Statement, FEIS, and Supplemental Environmental Impact Statement, SEIS, one cannot make a meaningful analysis of the pipeline’s economic, environmental, and national security impacts without it. 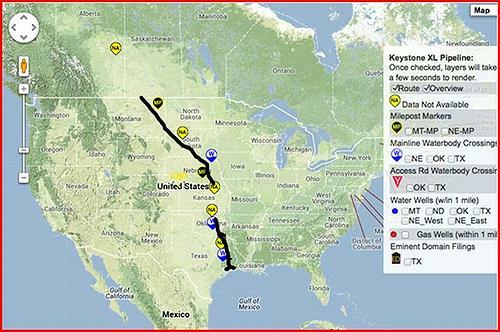 The FOIA request was filed in April 2012 as part of the Keystone Mapping Project, an ongoing multimedia and photography project examining land use and climate change in America through an exploration of the Keystone XL pipeline. With data obtained from state regulators along much of the route, the Keystone Mapping Project has assembled the most comprehensive publicly-available mapping resource for the proposed pipeline. The controversial pipeline has pitted landowners, communities, environmental advocates and scientists against the petroleum industry and government regulators. Critics fear increased risk of spills, expropriation of their lands and increased climate change as the heavy oil is burned. It is difficult, if not impossible, to understand how the State Department can claim to have performed adequate due diligence on the Keystone XL’s FEIS and SEIS without the missing routing data. The Keystone XL Pipeline is a proposed 1,179-mile (1,897 km), 36-inch-diameter pipeline that would carry 830,000 barrels of diluted heavy crude oil a day from the tar sands of northern Alberta, Canada to Steele City, Nebraska. Because the pipeline would cross the Canada-U.S. border, it requires a Presidential Permit stating that the pipeline would be in the U.S. national interest. President Barack Obama rejected TransCanada’s first permit application early in 2012 because it was tied to a 60-day Congressional deadline that did not allow time for Nebraska to approve a route that avoids the environmentally sensitive Sand Hills area located over the Ogllala aquifer. In May 2012, TransCanada filed a new application for a Presidential Permit with the State Department. TransCanada also chose to proceed with the southern portion of its Keystone expansion as a separate project, the Gulf Coast Pipeline Project from Nebraska to refineries in Texas. Because this section is wholly within the United States, no Presidential Permit is required. In January 2013, Nebraska Governor Dave Heineman approved TransCanada’s proposed route in his state. But the State Department is making its determination without knowing the exact route the proposed pipeline would take. “The information that you request, if it exists, is therefore neither physically nor constructively under the control of the Department of State and we are therefore unable to comply with your FOIA request,” wrote Sheryl Walter, director of the State Department Office of Information Programs and Services. Federal and state regulators consider pipeline routing information to be in the public domain, as evidenced by the release of routing data by the U.S. Army Corps of Engineers and the states of Montana, Nebraska, South Dakota, and Texas. The absence of routing data in the State Department’s FEIS and SEIS suggests that, if the Keystone XL presents a real national security risk, such risks have not been adequately addressed by Transcanada or the Department of State when preparing or reviewing these environmental impact statements. 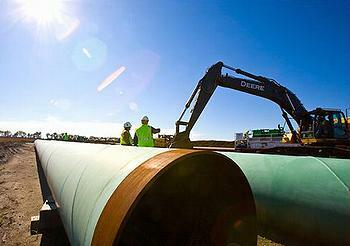 TransCanada only carries US$200 million in third party liability insurance for the Keystone. For comparison, cleanup costs for the 2010 accidental rupture of an Enbridge diluted bitumen pipeline on the Kalamazoo River in Michigan have exceeded $1 billion and continue to climb. As with past pipeline and oil industry accidents, any additional costs and risks not covered by TransCanada will be borne by the American taxpayers. By revealing that the State Department does not possess the most basic data on the Keystone XL pipeline, the FOIA response calls into question how the agency has evaluated the national security, economic, and environmental impacts associated with the Keystone XL. The Keystone Mapping Project is online at: http://keystone.steamingmules.com.